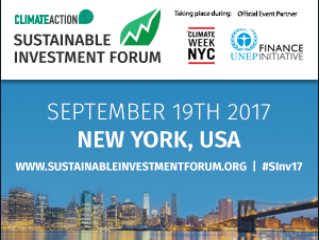 Now in its 8th year, the event will gather 600+ of the most influential national and local policy makers, UN agencies, business leaders, investors and international NGOs to meet, share knowledge and lead by example towards the full achievement of the Paris Agreement’s ambitious climate goals. With global governments now committed to action national plans to keep global warming below 2 degrees Celsius, the pressure is on for world economies to now move away from fossil fuels and towards low-carbon technologies, which requires significant investment across almost all economic sectors including energy, transport, agriculture and, construction. Driving increasing levels of climate finance will define one of the global challenges of our era, and with an annual investment gap of over $70 billion to fill, the race is on to transform global financial systems and make these investments viable. The UN estimates that investment in the range of $5 trillion to $7 trillion will be needed by 2050 – Want to play your part in financing a low-carbon future? Here is the place to do it! The Sustainable Innovation Forum is the largest business-focused event held during the annual Conference of Parties (COP), and this year heads to Bonn, Germany – the home of the UNFCCC. Join us and 600+ leading industry figures in November in Bonn, Germany to drive your business strategy and policy vision towards a more sustainable future.